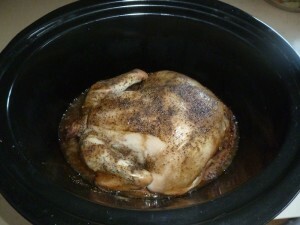 Crockpot chicken~ super simple, super easy, and seriously yummy. of energy leftover—especially toward the end of a long day. Often, the last thing that you want to do is cook dinner. Kids are climbing up your legs. Don’t you wish you had a kitchen helper? Likely, you do, lurking somewhere in a cabinet: a slow cooker, or crockpot. To me, using a crockpot is almost like having dinner out, but you’re eating in the comfort of your own home. You know the ingredients are good and the flavors are going to be just how you like them. But you barely had to lift a finger. Here’s my “little secret” when it comes to the crockpot: Don’t bother with special “slow cooker” recipes; use it as the world’s easiest way to cook your protein. For me, it’s usually beef, bison, chicken, or turkey. Yes, it’s that simple! Then, I use the meat in any which way I like. I can make tacos, Indian curry, Thai stir-fry, or plain old roast chicken, just by placing my meat and a few simple spices into my trusty crocker. Here is one of my family’s all-time favorites. Honestly, it can’t get any easier. To sweeten the crock just a bit, it’s a two-for-one deal: Roast the chicken on day one, and make a no-work bone broth on day two. Now it’s your turn. Do you love your crockpot, or is she just sitting there in the back of your cabinet? I’d LOVE to learn about your favorite crockpot recipes. Leave a comment below and while you’re at it, tell us a little story about how you manage to feed your family well with all the hustle and bustle of life.